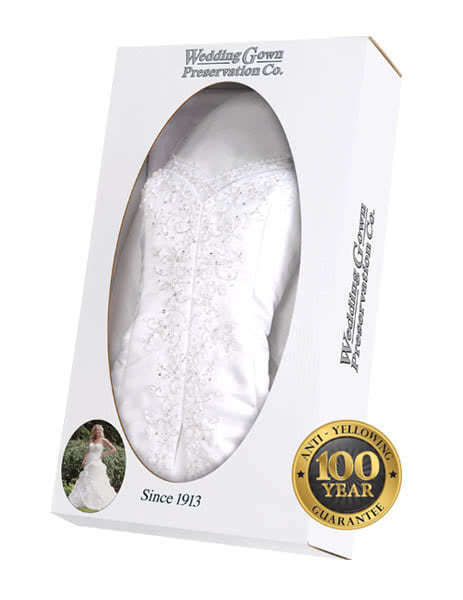 From the moment your gown arrives at the Wedding Gown Preservation Company, it begins receiving professional care normally reserved for museum grade garment care services. Your gown is carefully unboxed and immediately given an identification number as well as a barcode to ensure your gown can be located in our facility during every step of the cleaning and preservation process. This identification information is what powers our GownTracker™ system which allows you to enter your number into our system in order to find out where your wedding dress is in the preservation process. All these steps are to make sure our brides can rest easy knowing their gown is in good hands. After your wedding gown receives its tracking identifier, a fabric expert begins a meticulous examination process to identify any trouble areas. While your stain stickers help us identify areas you are concerned with, our experts go much more in depth by using UV light technology to identify invisible stains on your wedding dress that would eventually become unsightly blemishes if left untreated. Additional information such as tears, fabric wear, loose adornments, and other details are included in your gown report card to be addressed during the gown cleaning process. The Wedding Gown Preservation Co. has invested in a state of the art racking system manufactured in Germany specifically for their facility. As soon as your gown is cataloged into the system it is transferred to this innovative racking system where it begins its journey through each stage of cleaning and preservation. A special air handling system has also been installed in the preservation facility to keep air circulating in the temperature and humidity controlled preservation studio. Has a gown ever been lost in the preservation facility? No. The unique identification system ensures your gown is tracked from arrival to final shipment back to your home. How long does it take for my dress to be checked into the GownTracker system? Please allow 7-10 days after you send your gown in for us to enter it into our system for tracking. How do I know if my dress needs to be restored rather than preserved? We will contact you using your order contact information if we feel you should upgrade to a full wedding gown restoration. This service is normally recommended for gowns that are over 20 years. Do You have Additional Questions About Sending in Your Gown?